Are you are looking for the classic look of a Dutch door, but also want to make a statement, and expression of your personality? 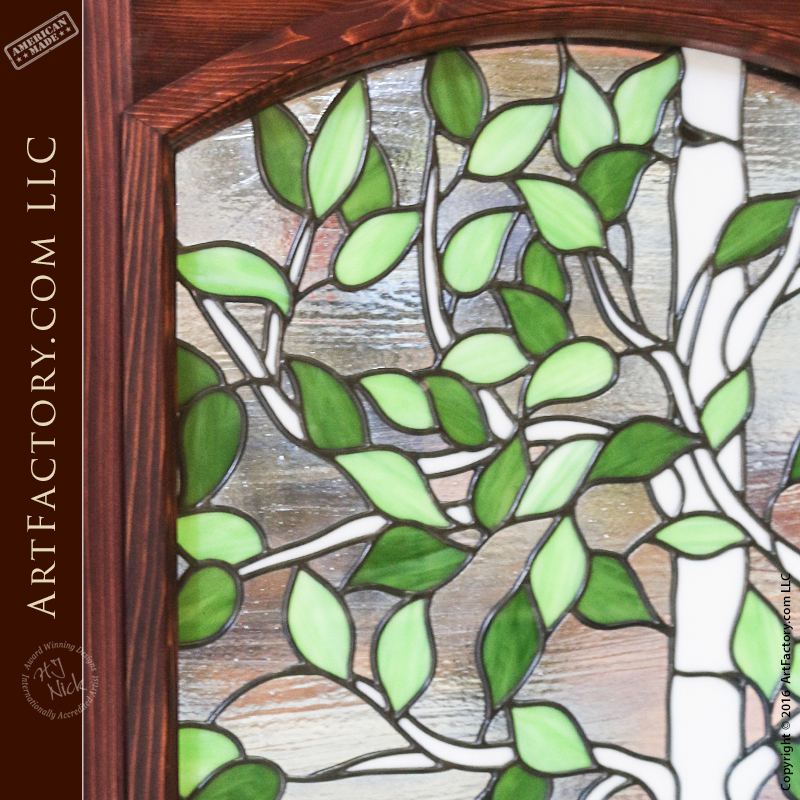 Then our stained glass Dutch door is for you. These customers from Colorado wanted to celebrate their love of aspen trees, and the enjoyment of watching the aspen trees in their back yard. We build all of our doors with solid, full length, naturally air dried timber. Additionally, each door is handcrafted by master builders using mortise and tenon joinery. In other words, this door is built to last. Finally, expert finishers apply the finish via a multi-step, hand rubbed process. A hand rubbed finish blends into the grain of the wood. What this means, is that your finish won't fade, flake, or chip the way like paint. This door, as shown, features a red mahogany finish. At ArtFactory.com we offer 100's of glass choices for our custom Dutch doors. If you are looking for something traditional, we offer thick tempered, clear and decorative styles of glass. We also offer custom Dutch Doors with multi-panel style windows such as our custom 12 glass panel dutch door. 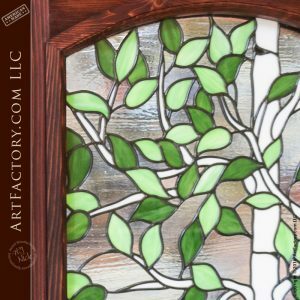 However, if you are looking to truly make a statement, then our fine art, stained glass can be made to any design that you desire. Our master glassworkers, hand cut and kiln fire, our stained glass using traditional methods from antiquity. Each door is a unique work of fine art that is built only once, and never mass produced. Furthermore, all of our products are built under the supervision of renowned artist H.J. Nick to assure that every items meets world class, fine art standards. All doors from ArtFactory.com include custom, hand forged hardware. 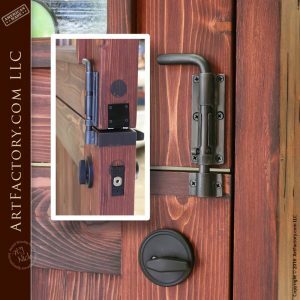 We truly build door hardware that is second to none. First of all, we exclusively use only solid pure top quality metals. We prefer wrought iron, but can also custom make hardware from copper, brass, and even precious metals. Second, our hardware is always hand forged by expert blacksmiths using fire, hammer, and anvil. Nothing from our shop is ever cast, drop forged, or built hollow. Finally, all of our hardware is finished to world class, fine art standards, and is hand patinated using a heat applied process. Our iron oxide patinas are applied at over 1000 degrees so that they finish bonds with the metal. This allows for a finish that won't fade over time.This door as pictured features one of our custom lever style door pulls with backplate. You can choose this pull, any other from our collection, or request a custom design. 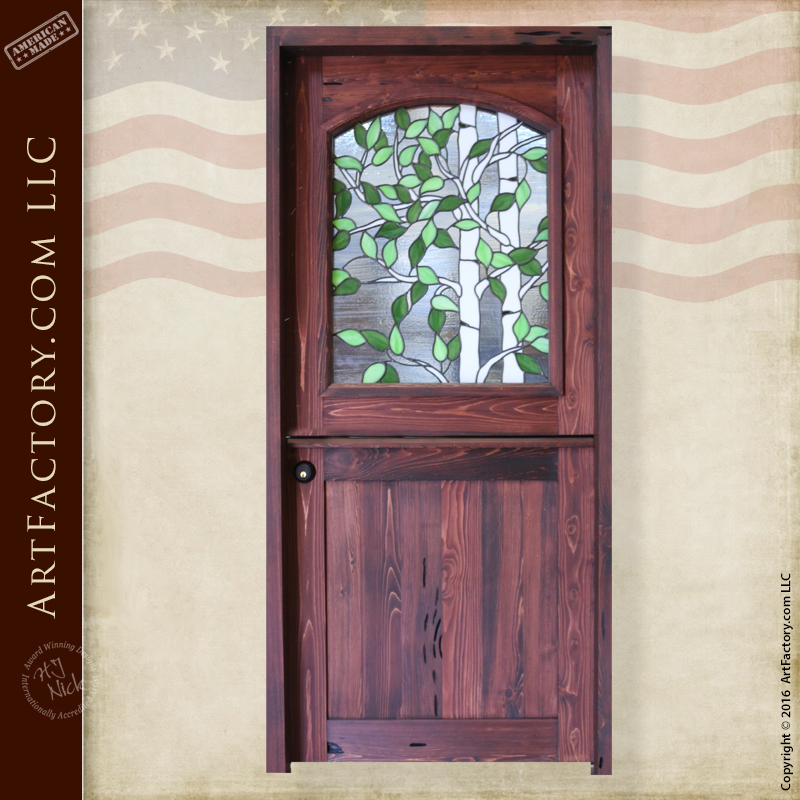 Stained glass Dutch Door and all wood doors are custom handcrafted in the original craft and are not reproduction fast process doors. Our master-level craftsmen, wood workers, and blacksmiths use their classical training and artistry to hand build our doors using historically correct methods that have been tried and tested throughout history to stand the test of time. Using the correct building methods and tools is especially relevant when creating historic designs. We can recreate a design specific to each client's need for an entrance that provides both maximum security and an investment quality. Order your dream Dutch door custom designed for your residential or commercial property today. Make a proper first impression that reflects your personality and accomplishments in the same way kings, queens and other aristocracy have done for thousands of years. Call us today at 1-800-292-0008 to speak with one of our talented design engineers, and get started on your dream custom door project. Never settle for the rest, when you can have the best, only at ArtFactory.com. As you may have guessed, the Dutch style of door originated in the Netherlands. Dutch Doors first began rising to popularity during the 17th century. Prior to the invention of electricity, this style of door provided enormous utility, particularly for farmers with free roaming livestock. The wooden bottom half of the door was sturdy enough to keep livestock outside. Meanwhile the upper window allows for a a way to allow light and increased airflow into the house. 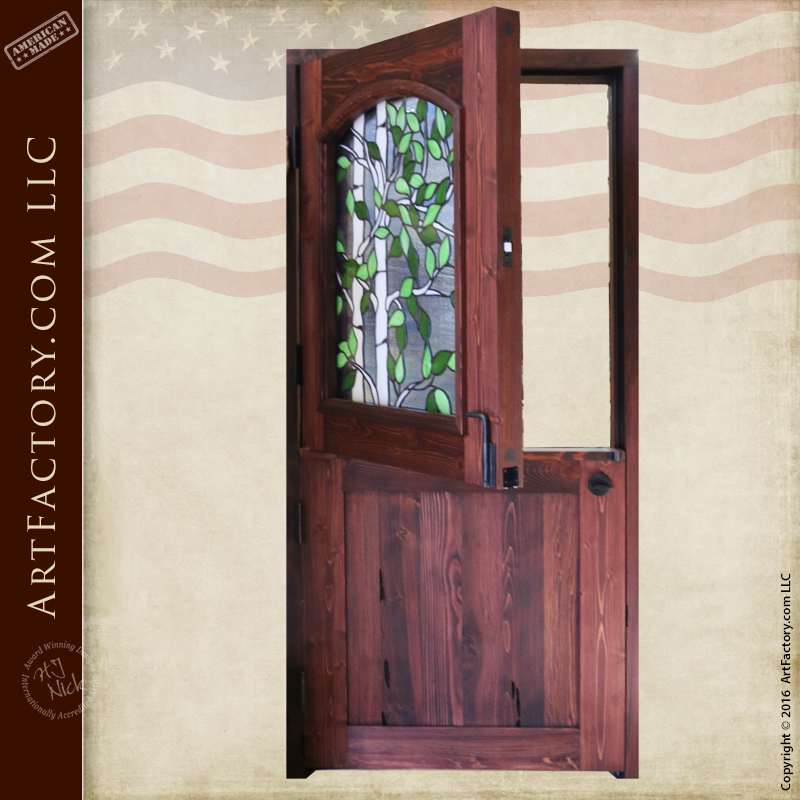 Early European colonizers of America brought the Dutch style of door with them, and they remained popular in America up through the beginning of the industrial revolution. Sidler, Scott. (2012, July 22) The Dutch Door: A Breath of Fresh Air. The Craftsman Blog.